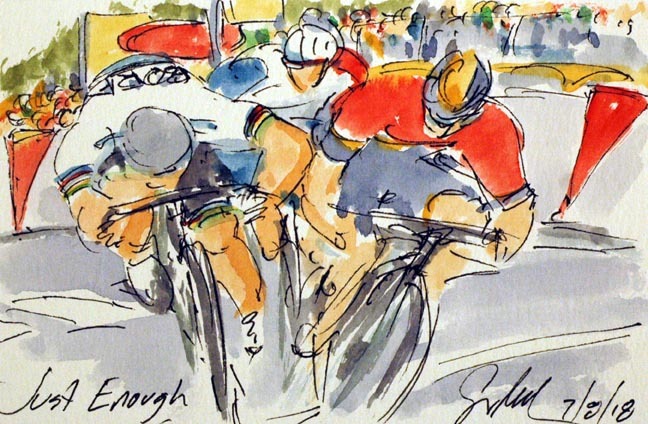 It was Peter Sagan (Bora-Hansgrohe) who had the perfectly time lunge to claim victory in La Rouche sur Yon. There was a crash with about 500 meters to go that took out both Michael Mathews (Sunweb) and Fernando Gaviria (Quick Step). It didn't seem to make the sprint any easier for the World Champion. He just barely held of the closing Italian, Sonny Colbrelli (Bahrain-Merida). For the second time today, it was Arnaud Demare (Groupama-FDJ) who opened up the sprint, but saw Sagan go around for the victory. Sagan's win earned him both the Maillot Jaune and the Maillot Vert. Apparently, the last time the Tour finished in La Rouche sur Yon, it was the wearer of the Rainbow Jersey who tooked the stage. As Sagan said in the post-race interview, "the same story keeps repeating over and over."